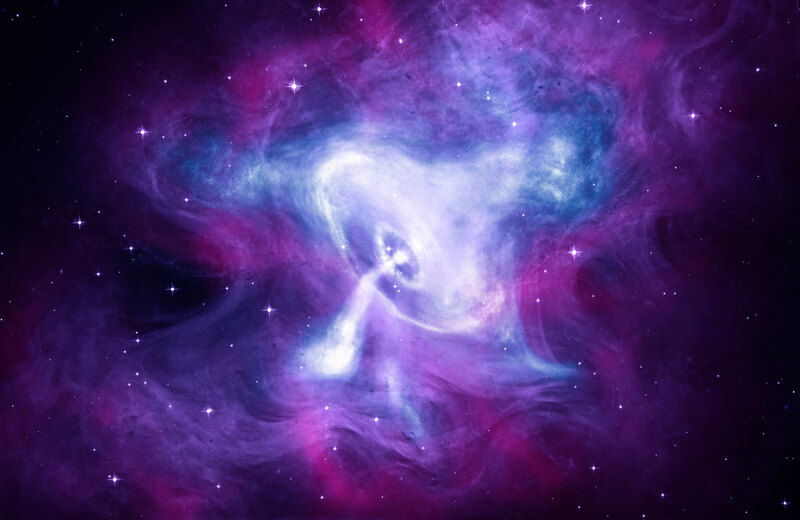 A new composite of the Crab Nebula with Chandra (blue and white), Hubble (purple), and Spitzer (pink) data. 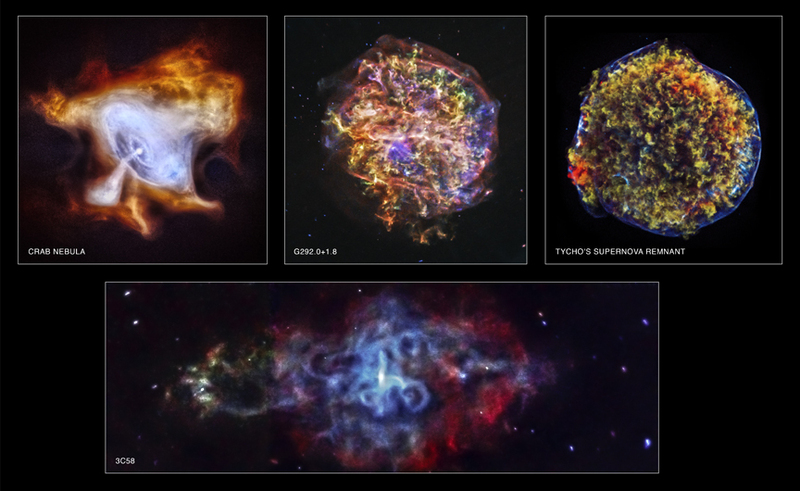 Next year marks the 20th anniversary of NASA’s Chandra X-ray Observatory launch into space. 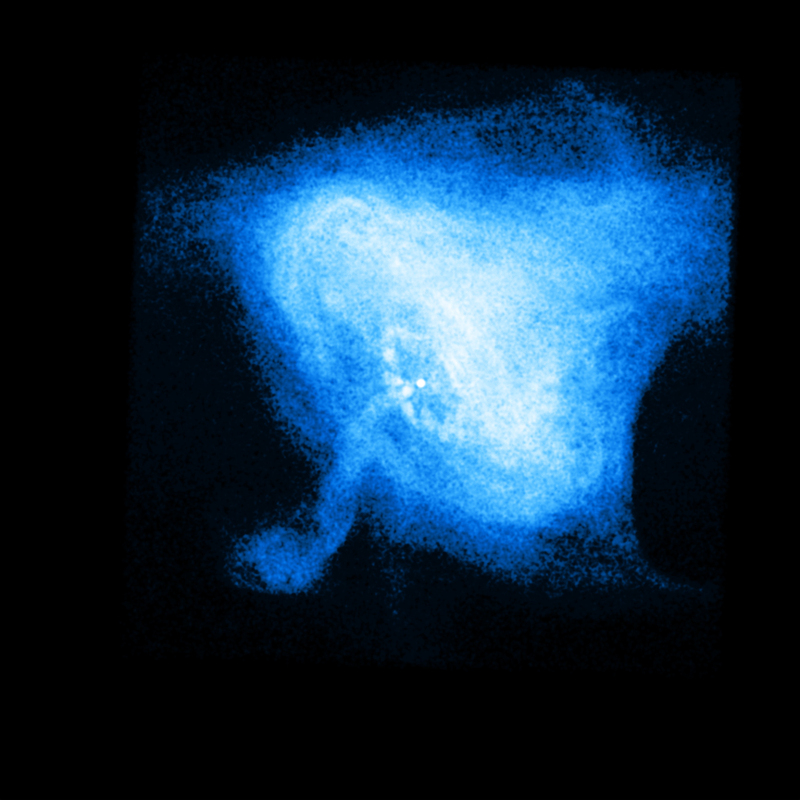 The Crab Nebula was one of the first objects that Chandra examined with its sharp X-ray vision, and it has been a frequent target of the telescope ever since. 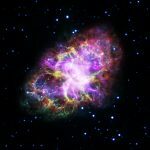 In the case of the Crab, observers in several countries reported the appearance of a “new star” in 1054 A.D. in the direction of the constellation Taurus. 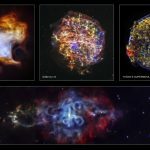 Much has been learned about the Crab in the centuries since then. 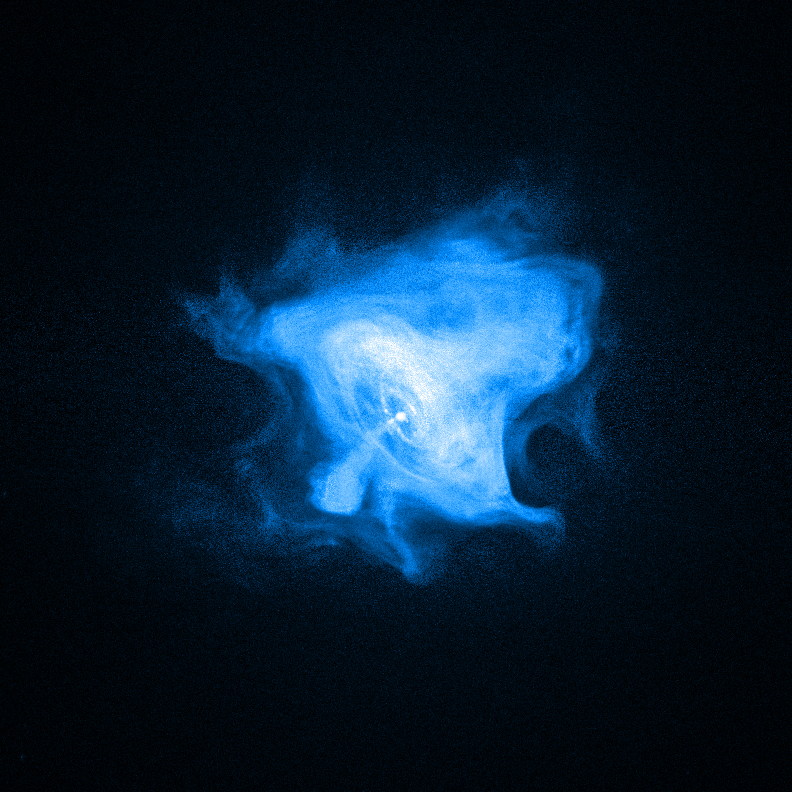 Today, astronomers know that the Crab Nebula is powered by a quickly spinning, highly magnetized neutron star called a pulsar, which was formed when a massive star ran out of its nuclear fuel and collapsed. The combination of rapid rotation and a strong magnetic field in the Crab generates an intense electromagnetic field that creates jets of matter and anti-matter moving away from both the north and south poles of the pulsar, and an intense wind flowing out in the equatorial direction. The Crab Nebula is the result of a bright supernova explosion seen by Chinese and other astronomers in the year 1054 A.D. A new image combines X-rays from Chandra (blue and white) with optical data from Hubble (purple) and infrared data from Spitzer (pink). 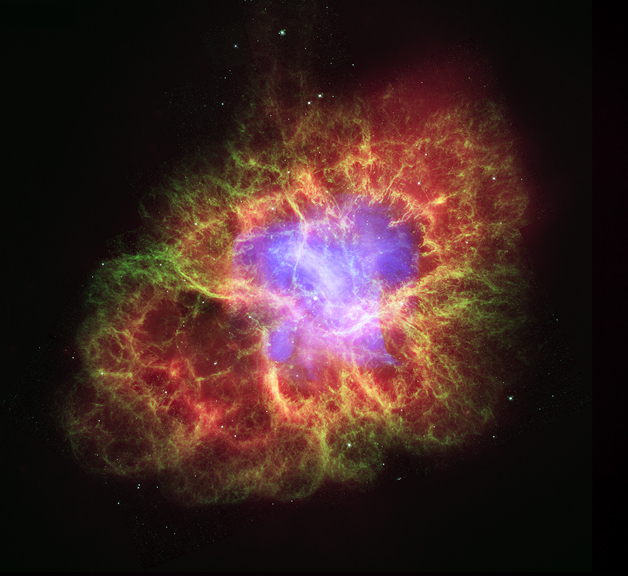 This composite adds to a scientific legacy, spanning nearly two decades, between Chandra and the Crab Nebula. 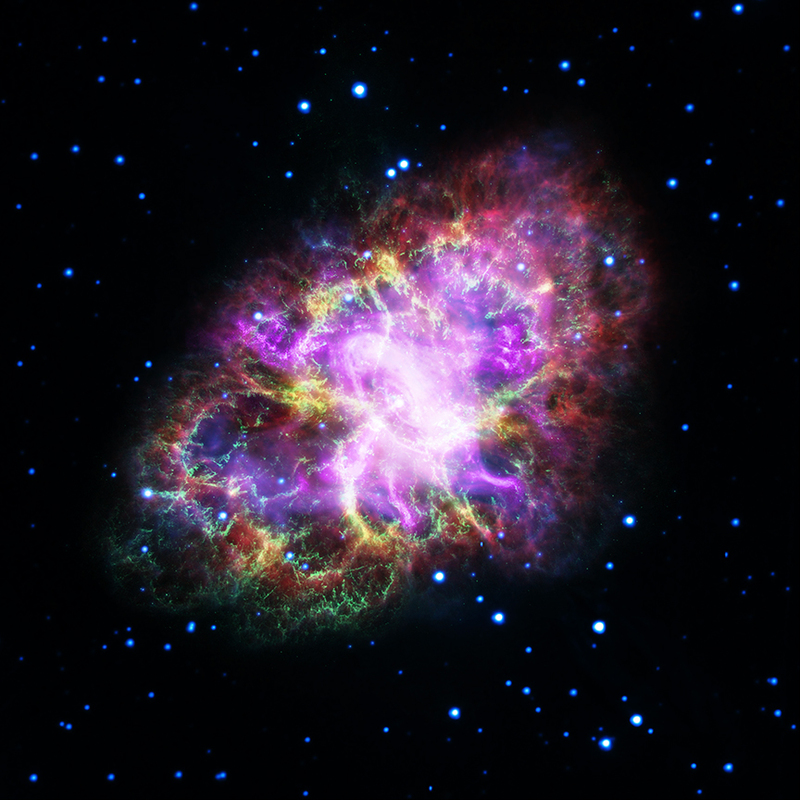 The latest image of the Crab is a composite with X-rays from Chandra (blue and white), NASA’s Hubble Space Telescope (purple) and NASA’s Spitzer Space Telescope (pink). 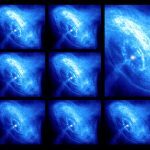 The extent of the X-rays in this image is smaller than the others because extremely energetic electrons emitting X-rays radiate away their energy more quickly than the lower-energy electrons emitting optical and infrared light. 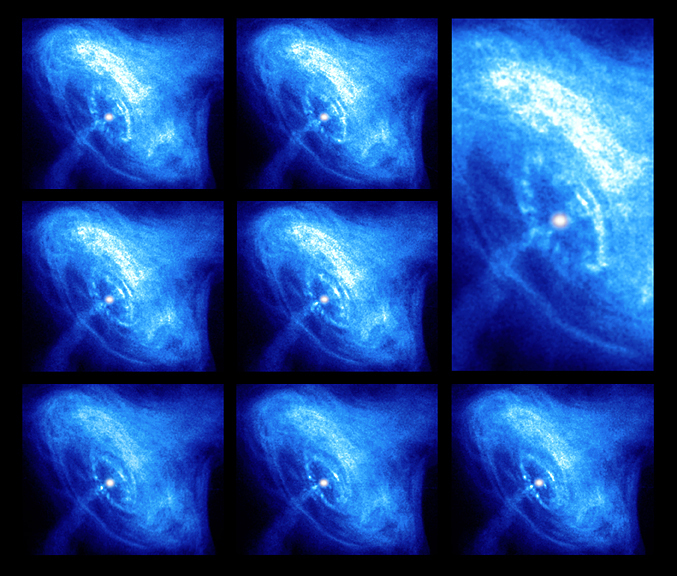 2011: Time-lapse movies of Chandra data of the Crab have been powerful tools in showing the dramatic variations in the X-ray emission near the pulsar. 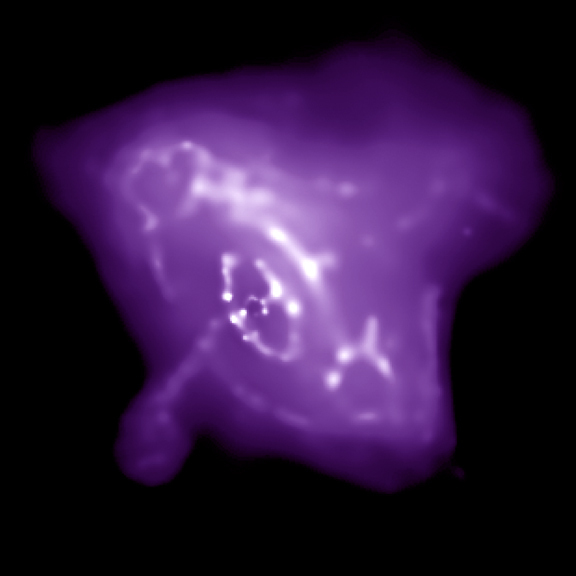 In 2011, Chandra observations, obtained between September 2010 and April 2011, were obtained to pinpoint the location of remarkable gamma-ray flares observed by NASA’s Fermi Gamma Ray Observatory and Italy’s AGILE Satellite. The gamma-ray observatories were not able to locate the source of the flares within the nebula, but astronomers hoped that Chandra, with its high-resolution images, would. 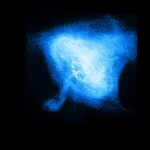 Be the first to comment on "Astronomers Reveal a Magnificent New Composite Image of the Crab Nebula"